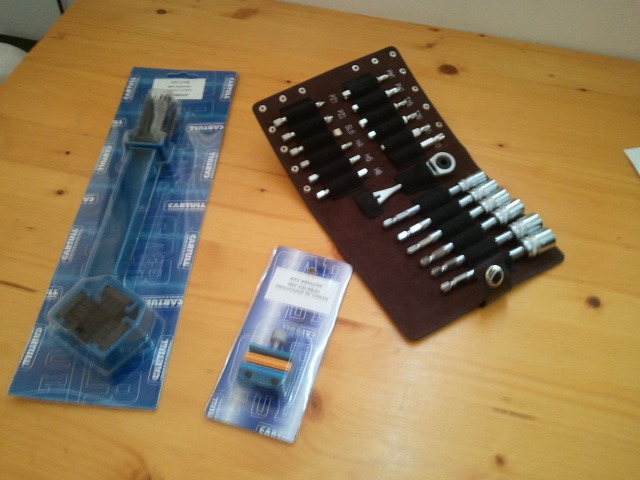 My very first purchase for the trip arrived last October: a portable toolkit, a brush to clean the chain and a small adapter to lubricate the throttle and clutch cables more easily. The one-year warranty on my bike expired shortly before I started planning this trip in September last year, so I decided that I needed to become familiar with the mechanics as quickly as possible and started doing the servicing myself. So far the toolkit has proven to be enough to perform basic servicing on the bike. This entry was posted in Equipment, Stroming The World 2013 by Kilian. Bookmark the permalink. How’s the cable lubricator? I saw one the other day and they look quite good. It is quite handy, apart from saving time and work it makes sure the lubricant gets to the end of the cable. It is still messy, mind you… some lubricant sprays out of it. Better wear gloves and have some rags at hand.